It's not that Terminator: Genisys isn't an admirable entry in a floundering franchise that peaked 24 years ago with Terminator 2: Judgment Day. In fact, there's something rather ingenious about the way it brings all of its main players together, through time travel, for an action-packed struggle to determine the fate of the dubious Skynet, and the world. But between all of the impressive set pieces, the film labours mightily in its attempts at humour and emotion, making it ultimately feel like a missed opportunity. While the franchise was predicated on time travel and characters' actions influencing the future, the plot is ridiculously convoluted for a series that's at its best when functioning as one long chase scene. On Judgment Day, the robots launched a war against humans and killed most of them through nuclear weapons. 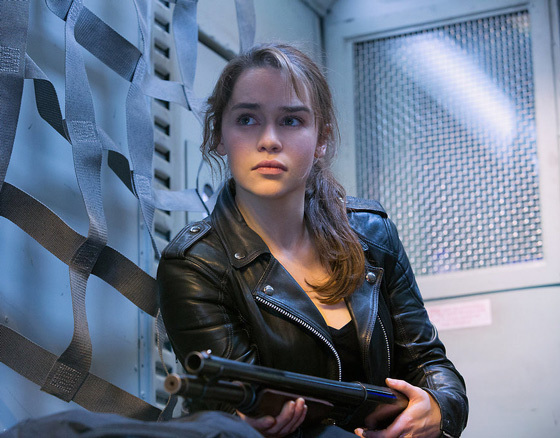 In 2029, the leader of the survivors in their battle against the machines, John Connor (Jason Clarke), sends his right-hand man Kyle Reese (Jai Courtney) back to 1984 to protect John's mother Sarah (Emilia Clarke) from a Terminator (a CGI-enhanced Arnold Schwarzenegger) sent by the machines to make sure John is never born. This is all shaping up pretty much like the original Terminator until Kyle finds that Sarah now already knows about Judgment Day. She was attacked previously as young girl by a T-1000 (think Robert Patrick from T2) and protected by a Terminator (a non-CGI-enhanced Schwarzenegger) who's now become a father figure to her. She wrestles with how to explain to Kyle that he's actually John's father while Schwarzenegger flatly asks her if they've mated yet. He's built a time machine and Sarah is about to travel to 1997 until Kyle convinces them that fractured timelines have caused Judgment Day to now be moved to 2017. The film coasts a little too much on nostalgia through these early scenes, revelling in the sight of seeing the older Arnold square off against his younger self and setting him up for memorable one-liners that sadly never really materialize. An extended action sequence re-introduces the T-1000 and serves as a nice reminder that seeing liquid metal rejuvenate is still pretty fun. Things kick into high gear once John and Sarah arrive in 2017, where they are surprised to find John waiting for them, and prepare to stop the highly anticipated unveiling of a new operating system called Genisys that will spell the end of civilization. Along the way, there's the requisite scene where a vehicle hangs precariously off a bridge, a rare helicopter chase and many rounds of ammunition unloaded in the effort. Schwarzenegger manages a few memorable moments almost in spite of the clunky dialogue. Emilia Clarke imbues Sarah with the right amount of grit and there's a sweetness if not exactly depth to her scenes with Schwarzenegger. It's disappointing then that there's so little chemistry between her and Courtney, who has the same bland charisma here that he brought to his role as John McClane's son in A Good Day To Die Hard. J.K. Simmons scores a few laughs in a small role as a cop who's been working the case for over 30 years and has about had it with all of these damn time traveling robots. With all of the time travel paradoxes the movie begins to unearth, and how much material has already been milked out of a relatively thin premise, it does seem as if the foundation of the franchise is starting to show its share of cracks. Perhaps the only reason this one fits in so well alongside the other instalments after T2, and the departure of creator James Cameron, is by virtue of its mediocrity. "Old, but not obsolete," Schwarzenegger's Terminator is fond of saying of himself in the film. Not yet maybe, but it's getting there.